I have been in creativity OVERLOAD and LOVE IT! I just finished a rockin’ three day webinar on Creative Live with James Wedmore about You Tube and I couldn’t take notes fast enough. It was so inspiring I am actually entertaining learning how to create videos of my work. As you can imagine it will be a learning curve but one that juices me up when I think about it! I am also taking a wonderful class called, Blog Boss with Holly Becker of Decor8. I have been learning, watching, absorbing and inspired, hoping to make our blog better. I am also entertaining starting a second blog and researching ways to make it special & meaningful (more to come!). This weeks homework was to closely examine blogs we love and do a case study on them. Here are 8 blogs I LOVE & why I think they ROCK! Jessica Swift’s blog, Treasuring is amazingly colorful and FUN. I imagine her to be genuine and sweet and I am in love with her creative work. She shares her inspiration, snippets of her current work, the different series she writes and little bit of her daily life. She is one gal I would love to know. Alyson Stanfield’s blog is wonderful not only for its ease in navigation but for the content as well. 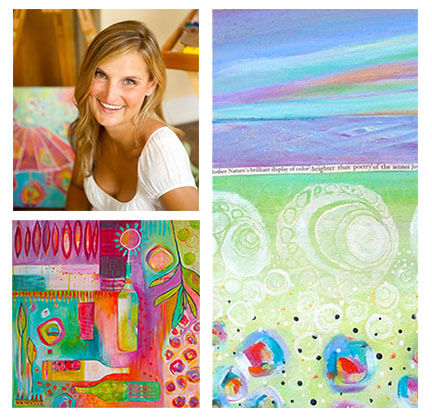 Her blog is about art business and she is amazingly generous with the information she shares. Alyson is current, stays on top of trends and is always re-evaluating, assessing and updating her own blog and business. She makes me strive for the same commitment to excellence she empowers. I recently discovered Alisa Burke and love the clean layout of her blog. It is easy to navigate and her pictures are uniform and engaging. She has a unique font she uses for her titles and I am drawn to the sweet, hand drawn social media buttons with her artwork on them. Her many creative projects (which I LOVE) are photographed beautifully. This woman’s creativity never stops! SO very inspiring! Kelly Rae’s blog rocks in so many ways. Visually, I love the white background with a pop of color in the border. You know right away what the blog is about from her description and get a sense of her style. Her social media buttons are in several places making it easy to navigate and she has created a clever list documenting her journey as both an artist and business woman. Kelly Rae is brilliant at authentically marketing her work, making you want to cheer her on in her journey. 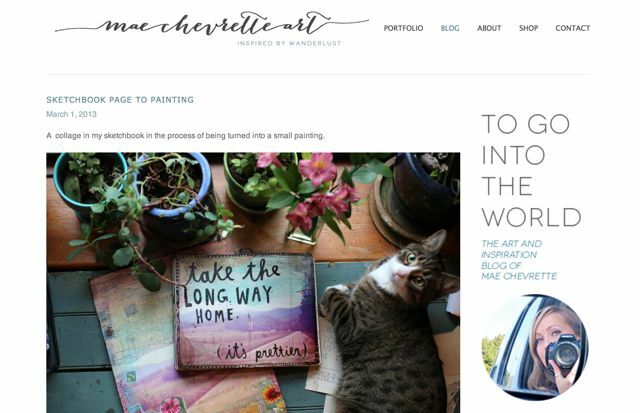 I am a huge fan of Mae Chevrette’s artwork and since her blog documents her creative journey it makes for an inspiring read. It is well written, clean and inspiring. I also love her photographs and the cute kitties that she photographs in her studio. It makes me wish I had a studio cat! I have followed Marisa of Creative Thursday for years now and am always inspired by her unique, authentic voice. She always seems to know just what I need to hear and is clear in her vision. 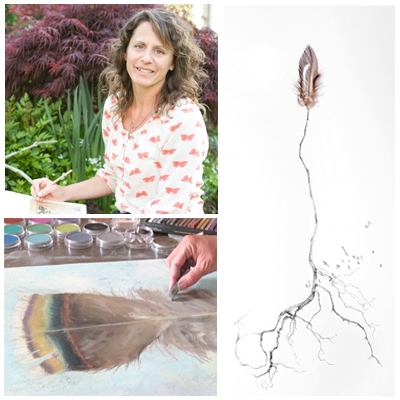 She follows her intuition and shares the many different ways her artwork has evolved. She like me believes in the “thriving artist” but is realistic and honestly speaks about the ups and downs of being an artist. Marisa is thoughtful, encouraging, always evolving and refreshing. I learned of Annetta Bosakova’s blog, Inspired from my class and I am blown away with her photographs! Her compositions, color and subject matter really resonate with me. I will enjoy following along in her journey and getting to know her better. Now who wouldn’t like a blog named, “Likes to Smile“? It makes me wish I had thought of the name myself! This blog celebrates the good things in life. I really appreciate Stacey, the authors creativity and sense of style. Hope you enjoy these blogs as much as me! What are your favorite blogs? Please share with us in the comments or if you write one of your own let us know and leave a link. We always enjoy learning and meeting new friends! can’t wait to look at these blogs! Hey Laura, It is good to see what you were talking about on the phone the other day. All of these blogs are definitely up your alley. I can see why you are inspired by them. What a great exercise for everyone to do. Thanks for sharing! Hello, girls! I absolutely loved the idea of this blog! I’ve never seen anything like it! I’m already following you with bloglovin. Wow! 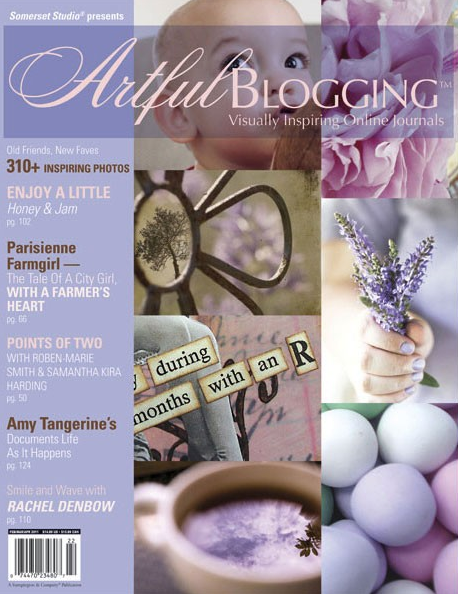 I’m honored that Art Biz Blog is included here. Thank you so much for sharing these terrific resources for others to be inspired. You are MOST welcome Alyson! You are quite an inspiration yourself!